Whether you are considering the installation of a residential floating dock or expanding a 200-slip commercial marina, Coastline Consulting, LLC has the skills, experience, and real world knowledge to handle your dock design and dock planning needs. Our team of professionals will walk you through the initial concepts to the final engineered dock design. We pride ourselves in successfully handling complex, unique, and non-traditional dock projects. Although every dock design is custom, Coastline Consulting, LLC typically follows our proven step by step approach as outlined below for small floating dock designs to large boat dock designs for marinas. Determining your vision, desire, and needs for a boat dock is the first step in our dock design process. Our staff will sit down with you to listen to your vision, ask lots of questions, and transform your thoughts to an engineered boat dock plan. 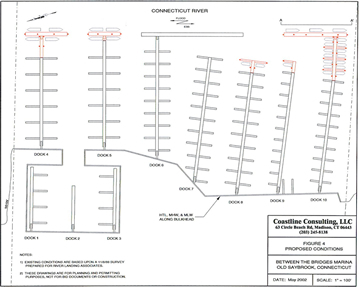 During this initial meeting, we will discuss the various options for floating dock plans and fixed pier plans, including boat dock berthing needs, dock construction materials, and an overall boat dock layout. With this conceptual plan in mind, we will move forward to evaluate your specific site. Our dock design team will walk your site during a period of low water to evaluate the feasibility of your proposed boat dock vision. We will evaluate the wave exposure, bottom substrate, tidal wetlands, environmental resources, and other site conditions which may impact the feasibility of your proposed boat dock design. With a preliminary dock plan and layout in mind, we will then initiate a waterfront survey. 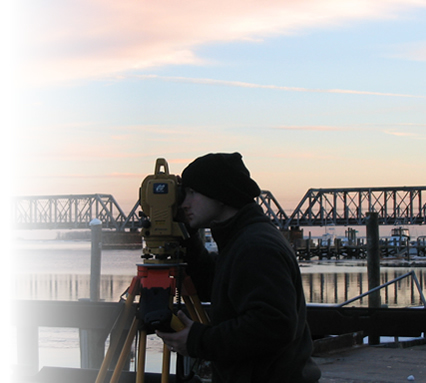 The objective of our waterfront survey is to obtain an accurate and detailed mapping of your specific waterfront area. A detailed survey will translate into a more accurate and detailed floating dock design or fixed pier plan in the later project phases. Coastline Consulting, LLC uses the newest Topcon GPT 3007 Total Station with reflectorless laser technology to conduct our surveys. Access to deepwater survey areas is achieved with our 23' Parker survey boat. Coastline Consulting, LLC prides itself on the utilization of technology to assist with all dock designs and dock plans. Following the waterfront site surveys, all upland and in water survey points are downloaded right from the survey data recorder to our in-office computers. At this point, our experienced in-house drafting and design team uses state-of-the-art computer aided design (CAD) software to map the details of the waterfront site. The precision of this technology and mapping process allows for the best possible dock design in the final project phase. The dock design and planning stage is most important to the success of your project. To initiate this phase, our design team will evaluate all of the critical data gathered to this point and weigh the numerous variables to begin formulating your dock plan. Our dock planning and design team considers your vision and desires to be the most important criteria in this process. However, our design team also evaluates other variables including water depth, tide range, bottom substrate, wave exposure, environmental resources, and the regulatory permit restrictions of your state. At this point, we also take your personal requests for dock construction materials into consideration, whether it is traditional wood, concrete, aluminum, synthetic materials, or exotic hardwoods. Using this information, our dock design team will evaluate and then prepare the best boat dock design and boat dock plans to meet your specific needs - making your dock vision a reality! Whether we have developed a customized floating dock plan for a waterside resident or a large scale boat dock plan for a marina, vision and imagination have now been transformed to an engineered plan. 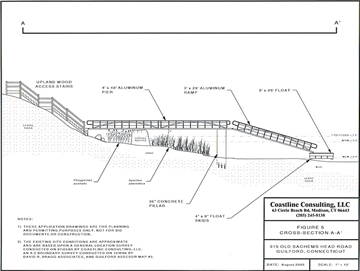 Coastline Consulting, LLC has extensive experience with both dock permitting and dock construction. Following the dock design and dock plan phase, we are also able to provide a complete turn-key approach to your project with our dock permitting services and subsequent dock construction management services.